Update: The latest firmware update (3.0.1) which you can find in LG’s On-Screen Control extends the variable refresh rate to 48-144Hz and reduces the input lag to around 4ms (down from ~14ms)! It’s been confirmed that FreeSync works with compatible NVIDIA cards without issues as well. Note that you can simultaneously use G-SYNC and HDR. The LG UltraGear 34GK950F-B may be the perfect ultrawide gaming monitor. 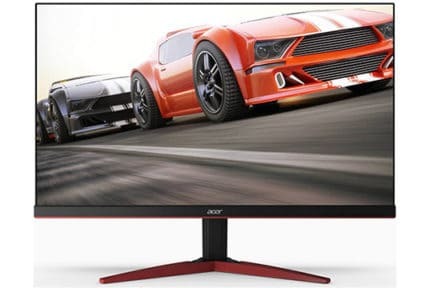 It’s the first monitor to boast a native 144Hz refresh rate at the 3440×1440 UWQHD resolution with the previous monitors being limited to 100Hz natively (120Hz overclocked). In addition, the LG 34GK950F features LG’s latest Nano IPS panel with a wide 98% DCI-P3 color gamut, Radeon FreeSync 2, 1ms Motion Blur Reduction, and VESA DisplayHDR 400-certified HDR10 support. The Nano IPS technology is LG’s answer to Samsung’s quantum dots. In short, it allows the display to achieve a wider color gamut by better LED backlight control. More in-depth information on how the technology works isn’t revealed by LG. With a boost in color gamut to 98% DCI-P3 (~135% sRGB), the image quality is notably better than that of the standard sRGB displays; the colors are much more vivid and vibrant. What’s more, the 3440×1440 21:9 ultrawide resolution of the LG 34GK950F curved monitor provides a rich pixel density with the perfect screen space/detail ratio without any scaling necessary. The LG 34GK950F monitor also supports HDR (High Dynamic Range) but it lacks local dimming for a contrast ratio performance that’s desirable for a good HDR viewing experience. However, implementing a good local dimming system would also significantly increase the price of the monitor. Overall, some content may look slightly better as the monitor does support a wide color gamut after all, but the lack of contrast is certainly apparent. The LG 34GK950F input lag amounts to ~4ms after the firmware update which is excellent. 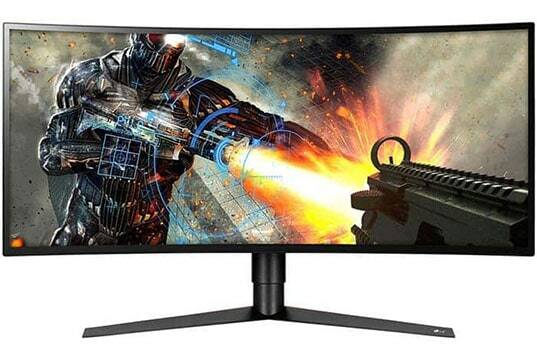 Moreover, the IPS panel of the monitor offers wide 178-degree viewing angles and a 5ms response time speed which, unlike that of VA-panel monitors, effectively eliminates motion blur and ghosting in fast-paced games. For the best response time performance, you should set the Overdrive setting to ‘Faster’ which is the highest option and doesn’t introduce pixel overshoot or inverse ghosting. In case you want the least amount of ghosting possible, there’s the 1ms Motion Blur Reduction technology which via backlight strobing further reduces the perceived motion blur of fast-moving objects. Note that this technology only works at either 120Hz or 144Hz and that it cannot be used at the same time as AMD FreeSync; It works with both NVIDIA and AMD graphics cards. Also, keep in mind that when this technology is enabled, the monitor’s maximum brightness is decreased, so use it only when playing fast-paced games. Using the 1ms MBR technology with brightness set over 50% can cause slight buzzing of the screen which is harmless as you won’t even be able to hear it over the in-game audio. The IPS glow is present as expected, though the glowing in the corners of the screen is tolerable and only prominent with dark backgrounds in dark rooms. 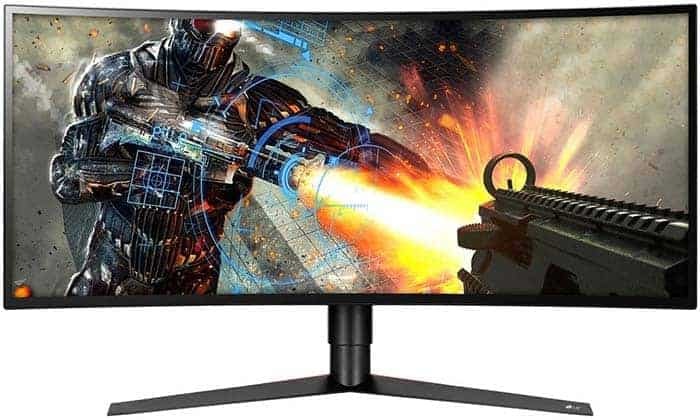 Moving on, the LG 34GK950F UltraGear monitor supports AMD FreeSync 2 technology which in addition to providing a variable refresh rate for compatible AMD GPUs and Xbox One consoles, also ensures responsive HDR gaming by bypassing excessive tone mapping processes. The LG 34GK950F FreeSync range is 55-144Hz thus supporting LFC (Low Framerate Compensation) for a smooth performance even when your FPS rate drops below 55. Other gaming-related features include Dynamic Action Sync for minimal input lag, Black Stabilizer for better visibility of objects in dark parts of video games, customizable crosshairs, and two customizable picture presets as well as the FPS and RTS pre-calibrated modes. Lastly, the LG 34GK950F is factory-calibrated for stunning color quality out of the box, its backlight is flicker-free, and there’s an integrated low-blue light filter. 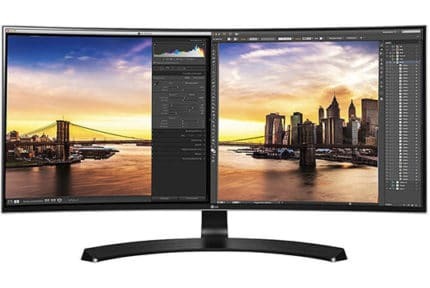 In order to reach 144Hz at 3440×1440, the LG 34GK950F ultrawide monitor features a DisplayPort 1.4. It also has two HDMI 2.0 ports, a dual-USB 3.0 hub, and a headphones jack. Note that your graphics card also needs DisplayPort 1.4 for 3440×1440 at 144Hz. If your GPU has a DP 1.2 port, you will be limited to 3440×1440 and 120Hz. Ergonomics include -5°/15° tilt, +/- 20° swivel, up to 110m height adjustment, and VESA mount compatibility. There’s also a cable bracket for cable management while the chassis is ‘borderless’ with thin frames on all four sides. The LG 34GK950 UltraGear series also includes the LG 34GK950G-B model which has NVIDIA G-SYNC instead of FreeSync 2. It’s also based on the Nano IPS technology but it lacks the HDR support and it’s overclockable to 120Hz with a 100Hz native refresh rate. 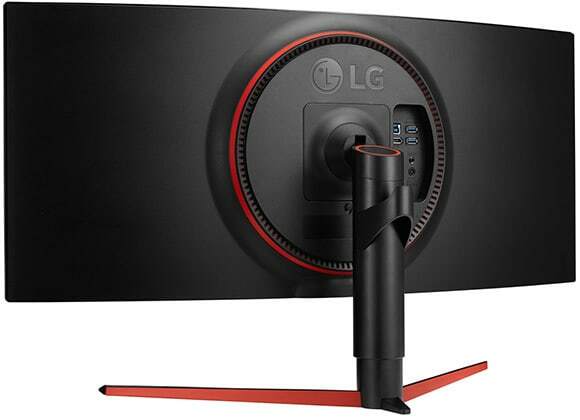 The LG 34GK950F price amounts to around $1000 which is fair and certainly worth it considering the monitor’s specs and performance. If you’re interested in similar ultrawide monitor with G-SYNC instead, be sure to check out the Dell Alienware AW3418DW. The LG 34GK950F offers both immersive and responsive gameplay experience. While the 144Hz refresh rate and quick response time take care of motion clarity, the huge 1440p ultrawide curved screen with the impeccable nano IPS panel ensures stunning visuals and immersion. The LG 34GK950F is the perfect ultrawide gaming monitor. It offers an immersive image quality with stunning colors without sacrificing motion clarity. What's more, it's got plenty of features and a great design with plenty of connectivity options.